Being a parent is a tough job and a major responsibility. Of course, it would seem that a lot of parents out there don't give a rat's rear end about how they are teaching their children. A lot of them probably don't even really think through how they live their lives out in front of their kids. They make selfish, daily, financial decisions without even giving consideration to how their attitudes and actions may appear to their children. If you are a responsible parent and really do care about how your attitude and actions are impacting your kids, then consider how you are impacting them in the area of generosity. In this post, I would like to offer four thoughts on how you can teach your children the important character trait of generosity. Model generosity. One memory from my childhood that has stuck with me for several years now is remembering my father picking up a hitchhiker or homeless guy on the side of the street and taking him to McDonald's for a meal. In today's world that might not be the brightest thing to do with a couple of young kids in the backseat of the car, but even some 35 years later, I can still recall this act of generosity by my dad. I also recall him regularly placing out my parent's tithe envelope on Saturday evenings to take to church the next day. My parents also gave regularly of their time and abilities to the ministries of our church. Whether we like it or not, kids really do watch and learn from what we do as parents as much as from what we say. If we want our children to be generous, then we need to show them what generosity looks like. Whenever my daughters and I are out and about running errands and we come across an organization that is collecting money, such as the Salvation Army or various veteran's groups, I always try to use these as teaching moments for all of us to give back to those in need. Teach through money management. Using the old Dave Ramsey 3 envelope system for kids - Give, Save, Spend - this really is a helpful tool for children to allocate their money for these three important areas. Have them fund their Give envelopes regularly and generously. Then, remind them to take their Give envelopes with them to church each week and place that money in the offering plate. Legislate first, then allow self-governance. When your kids are little, have them divide up their allowance or commission money so that a portion of it does indeed make it inside the Give envelope. As your kids get older, though, relax the conditions of their money and see what happens. Hopefully through modeling, teaching, and legislating, the generosity principle is taking root deep down in their spirit. The only way to test this and find out is to gradually let go of the controls and see if they really do understand what generosity is all about. Let them divide up their money appropriately on their own, monitor the situation, and see how they do. Take on a family project. Outside of giving regularly to your church, you could consider taking on a regular missions project in which the whole family can participate. These outside projects could range from helping out on a regular basis at a local food bank or homeless shelter all the way to helping build a school in Africa. I would say the only restrictions on your project would be how much time and money you can actually allocate to what you would like to do! 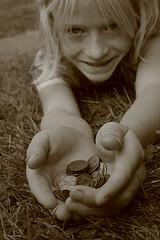 Do you have additional thoughts or ideas that you have used in your family to teach kids to be generous? If so, I'd love to hear your stories. Just leave me a comment below.